An earthquake with a 7.9 magnitude has struck off the coast of the Philippines which at a depth of 34.9km east of the Philippines. According to the Pacific Tsunami Warning Center, the quake prompted a tsunami warning for parts of Indonesia, the Philippines, Taiwan, Japan, Guam and other islands in the Pacific including the U.S. state of Hawaii. If a tsunami is generated it could cause significant damage to coastal areas even distant from the epicenter of the earthquake. The 12th Tropical Depression was upgraded to a named storm as it continued to strengthen in the tropical waters of the Atlantic. After growing to hurricane strength, it has weakened to a tropical storm again, but is expected to regain hurricane strength. It is continuing northward towards Newfoundland, Canada, after dumping rain and high winds on Bermuda for the last couple of days. Other than some downed trees and power outages, Leslie didn't cause any major damage. Norwegian Dawn will have a delayed arrival into Bermuda. Norwegian Star will sail as scheduled to Bermuda on Sunday, September 9 from New York. Jewel of the Seas cancelled its call to St. John's, Newfoundland, on Thursday, September 13, and continues to proceed to its scheduled turn-around in Boston on Sunday, September 16. Brilliance of the Seas -- will skip the Faroe Islands and proceed directly to Iceland. INTERESTS IN NEWFOUNDLAND SHOULD MONITOR THE PROGRESS OF LESLIE. WITHIN THE WATCH AREA...IN THIS CASE WITHIN 24 TO 36 HOURS. RAINFALL...RAINS WILL GRADUALLY DECREASE DURING THE DAY. 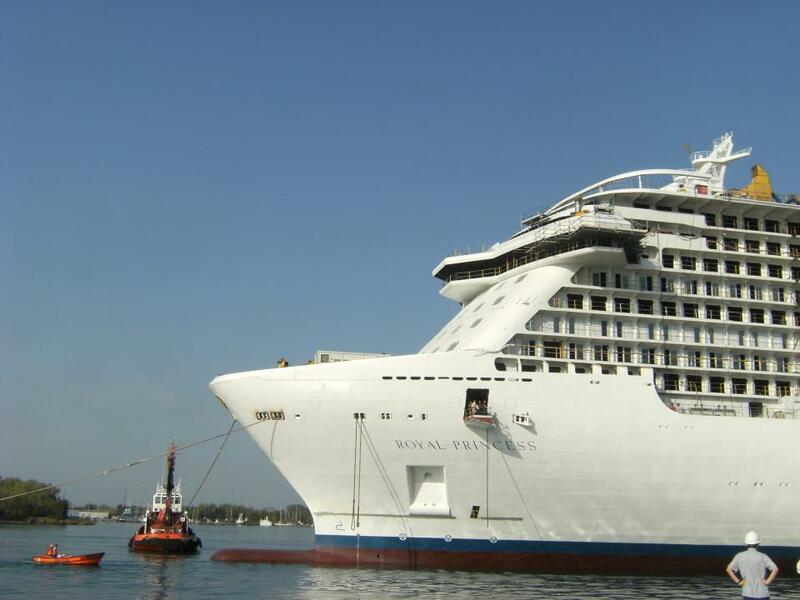 Earlier this month, Royal Princess completed its sea trials, a major milestone during the construction of a new ship. 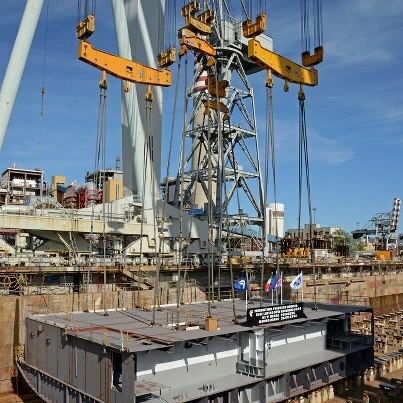 The construction of "Royal Princess" consolidates Fincantieri’s primacy in building the largest passenger ships in Italian shipbuilding history. In fact, at 141,000 gross tons, 330 metres long and 38 metres wide, the new ship is the largest ship ever built by Fincantieri. It has 1,780 cabins, of which 1,438 with balconies (81% of the total), and is able to accommodate 3,600 passengers, with total capacity for over 5,600 people including crew. Attending the ceremony for Princess Cruises were Alan Buckelew, President and CEO, Rai Caluori, Vice President Fleet Operations, and Stuart Hawkins, Vice President Newbuilding. Representing Fincantieri were, among others, Gabriele Cocco, Executive Senior Vice President Merchant Vessels, and Carlo De Marco, Shipyard Manager. Godmother of the ceremony was Victoria Nash, Captain Nick Nash’s daughter, who was christened on board of the first Royal Princess. As an innovative prototype for a new ground-breaking class of ship, "Royal Princess" stands out for its new "future-proof design", not only in terms of layout and state-of-the-art performance, but also because it complies with the most recent regulations in shipping. Among the keystones of this trend are the rational use of space, with the aim of avoiding any wasted tonnage that would otherwise increase operating costs, and energy saving to reduce emissions into the atmosphere and water. The ship will be able to adapt to every possible type of cruise, operating from Alaska to Australia, even in environmentally protected areas where navigation is restricted. WORK BEGINS ON "REGAL PRINCESS"
The start of construction of the new "Regal Princess" passenger ship was marked with the laying of its keel, weighing approximately 500 tons, during a ceremony held today at the Fincantieri shipyard in Monfalcone, Italy. .
We've mentioned on several occasions that the official start of construction of a new ship begins when the first block of steel is laid. It is known as the laying of the keel. This tradition includes the laying of a ceremonial coin to bring good fortune. Princess Cruises ordered two ships from Fincantieri shipyard. "Regal Princess" will be the second of two ships ordered from Fincantieri in 2010, both of which using the same prototype design. It will therefore have the same record-breaking vital statistics as "Royal Princess", the largest ship ever built in Italian shipbuilding history: 141,000 gross tons, with a capacity for 3,600 passengers. These ships represent a new technological benchmark in Europe and worldwide for their innovative layout, and the outstanding performance and top quality of their state-of-the-art technology. Following a traditional blessing by a priest, the ship’s keel was moved into position by a huge crane onto the keel blocks. The computer-guided maneuver took only minutes, but is a major accomplishment for Princess Cruises and the shipyard. Regal Princess will offer many of the same special features as Royal Princess, which debuts in June 2013. Among these are a greatly expanded atrium, the social hub of the ship; a dramatic over-water SeaWalk, a top-deck glass-bottomed walkway extending more than 28 feet beyond the edge of the vessel; plush private poolside cabanas that appear to be floating on the water; the new Princess Live! television studio; a pastry shop; a special Chef’s Table Lumiere, a private dining experience that surrounds diners in a curtain of light; and balconies on all outside staterooms. In the interest of readability, we have split the historical cruise ship impact from the current advisories. Select the article that covers the time period you are interested in. FUNtastic news! The Port of New Orleans will reopen early tomorrow morning. Due to the time required to transit the Mississippi River, the ship will be alongside in the afternoon. We’ll be busy saying good bye to our disembarking guests, so check in for your 3 day Fun Cruise @ Sea will now take place between 6:00 PM to 9:00 PM on Friday, August 31, 2012 at the Erato Street Cruise Terminal. Refunds will not be provided for flight changes, hotel accommodations, meals, transfers, or other incidental costs. However, guests who purchased Carnival’s Vacation Protection Plan should check their plan for reimbursement considerations. Guests who purchased flights with Carnival's FlyAweigh program will automatically have their flights adjusted to the new day and time. You will be notified of your new flights by our Travel Services department. Guests with independent flight arrangements, please adjust your travel plans accordingly. We certainly hope you’ll sail with us but if you elect to cancel, please contact 1-800-CARNIVAL to request your future cruise credit. To stay up to date, if you have not done so already, please sign up for text updates by texting CCL1 to CRUISE (278473). Once again, we are sorry the weather has caused a delay in getting your fun started. Rest assured, once you step on board, we'll waste no time in getting it going! We are closely monitoring Tropical Storm Isaac and keeping in close contact with port officials. Officials at the Port of New Orleans have informed us the Mississippi River remains closed to ship traffic. Since it is uncertain when the river will reopen, the Carnival Elation will now proceed to the Port of Mobile. Weather permitting, debark will take place on Friday morning. Guests will be bused back to New Orleans. 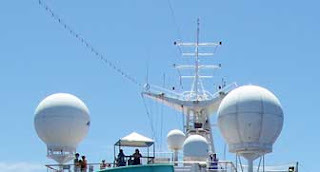 Our scheduled 4-day cruise will be shortened to a 3-day Fun Cruise @ Sea departing on Friday, August 31, 2012. Please proceed to the Port of New Orleans and plan to arrive between 1:00 PM and 4:00 PM on Friday. The parking garage at the port will be open. Busses will take guests and their luggage to Mobile. We sincerely apologize for this disruption to your cruise. Here are your options. Should you wish to cancel or reschedule, please contact 1-800-CARNIVAL to request your future cruise credit. Guest who purchased flights with Carnival’s FlyAweigh program will automatically have their flights adjusted to the new day and time. You will be notified of your new flights by our Travel Services department. Guests with independent flight arrangements, please adjust your travel plans accordingly. To stay up to date on any changes, we encourage you to sign up for text alerts by texting CCL1 to CRUISE (278473). If you have already done so during your online check-in, you will automatically receive updates. Once again, we’re very sorry that Mother Nature did not cooperate with our plans. However, we’re confident you’ll have loads of fun on board. At the moment, there are no changes expected for any other sailings departing on or after Thursday, August 30, 2012. In the event we need to make a deviation to a future itinerary, we will update our guests. Due to its projected path, CARGO operations at the Port of New Orleans closed yesterday (Aug. 27) at 5 p.m and will remain closed today (Aug. 28) and tomorrow (Aug. 29). There's no word yet from Carnival Cruises Lines on whether the Aug. 30 departure of Carnival Elation, the next scheduled ship to sail out of New Orleans, will be affected. Good news! The Port of Miami has reopened. Check-in is set from 8:00pm to 11:00pm. Due to limited seating, please do not proceed to the cruise terminal any earlier than 8:00 PM. We’ve secured the Doubletree Convention Center in the event you need a place to wait. 711 N.W. 72nd Avenue, Miami, FL, 33126, Phn# 305-261-3800. Also, enjoy dinner on us tonight. We will post a $25 per person credit to your Sail & Sign account. Carnival Destiny, departing on a five-night voyage from Miami on Saturday, will stop at Grand Cayman (instead of Ocho Rios) on Monday and Ocho Rios (instead of Grand Cayman) on Tuesday. Carnival Dream, which will be departing on a seven-night sailing from Port Canaveral on Saturday, will skip its Nassau call on Sunday in favor of a sea day. The ship will now pay a visit to St. Maarten (instead of St. Thomas) on Tuesday and St. Thomas (instead of St. Maarten) on Wednesday, and a sea day originally scheduled for Thursday will be replaced with a call on Grand Turk. Due to unfavorable weather conditions expected in Half Moon Cay tomorrow, the Carnival Ecstasy will cancel the call into Half Moon Cay and will replace it with a visit to Freeport on Saturday from 8:00 AM to 5:00 PM. 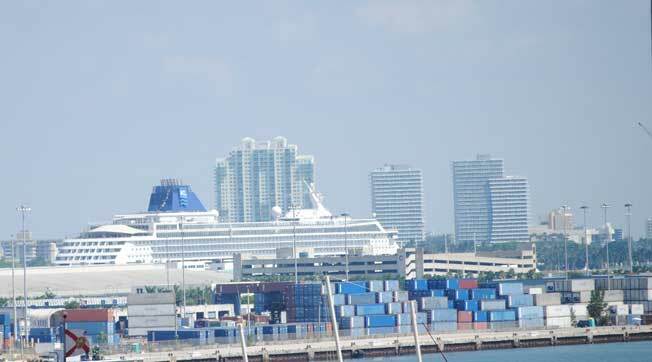 The Port of Miami is expected to close by 11:00 PM on Saturday. Weather permitting, the port will reopen on Monday at noon. The Carnival Imagination will remain at sea at a safe distance from the storm until the port reopens. Check-in for the Carnival Imagination is set for 4:00 PM – 7:30 PM and sailing is set for 8:00 PM. The Port of Tampa is expected to close by 3:00 AM on Sunday. At this time, they are uncertain as to when the port will reopen. Therefore, we have made arrangements to dock at Port Canaveral instead, where we will arrive at 8:00 AM on Sunday. Busses will be available to take guests to the Port of Tampa or the Tampa airport. The parking garage at the port will be open. It will take approximately two and a half hours to the Port of Tampa from Port Canaveral. Due to the expected port closure in Tampa, the Carnival Legend will dock in Port Canaveral on Sunday. We ask that guests proceed to the Port of Tampa and plan to arrive between 10:00 AM and 3:00 PM. The parking garage at the port will be open to park your vehicle. We will have busses available to take you and your luggage to Port Canaveral. Please do not proceed to Port Canaveral directly as the ship will be docking in Tampa when we return next week. It will take approximately two and a half hours to Port Canaveral from the Port of Tampa and no adverse weather is expected. The last bus will depart from Tampa at 4:00 PM and we expect to sail at 8:00 PM. At this time, our itinerary remains unchanged. However, there is a possibility we may have to make changes, depending on the path of the storm. Due to high winds and heavy swells, the Carnival Liberty cancelled the call into Grand Turk and replaced it with a visit to Nassau on Friday from 10:00 AM to 6:00PM. In order to stay ahead of the storm and for the safety and comfort of our guests, the Carnival Valor cancelled the call into Curaçao and replaced it with a visit to Nassau on Saturday from 10:00 AM to 5:00 PM. CARNIVAL VALOR – 8/26/12 DEPARTUREOur scheduled 6 day cruise will be shortened to a 5 day cruise visiting Grand Cayman and Montego Bay. Unfortunately, this means we will cancel our call in Key West. Check-in for your cruise is now scheduled on Monday August 27, 2012, from 4:00 PM to 7:30 PM, and sailing is set for 8:00 PM. The times in Grand Cayman & Montego Bay remain unchanged. - Refunds will not be provided for flight changes, hotel accommodations, meals, transfers or other incidental costs. • We realize this is an unexpected change in your travel plans and we certainly hope you still cruise with us. However, should you wish to cancel or reschedule, please contact 1800 CARNIVAL to request your refund or future cruise credit. The safety of our Guests and Crew is always our first priority at Disney Cruise Line. We are closely monitoring the current weather conditions and path of Tropical Storm Isaac through the National Weather Service. Should weather conditions change, our Captains can alter the ship's course or itinerary for the safety and well being of our Guests. Given Tropical Storm Isaac’s current location and projected path, and the forecasted weather for South Florida, Allure of the Seas’next sailing will now begin on Tuesday, August 28. We ask that guests who are scheduled to sail on Allure of the Season Sunday, August 26, not arrive at the port until 11:30 a.m. on Tuesday, August 28. We kindly ask that guests come to the terminal between 11:30 a.m. and 4:00 p.m. on Tuesday, August 28, for check-in and boarding. Regrettably, the delayed departure will have an impact on the scheduled itinerary. Allure of the Seas will now spend Wednesday, August 29, at sea, call to Cozumel, Mexico, on Thursday, August 30, spend Friday, August 31, at sea, and Nassau, Bahamas, on Saturday, September 1. If you are sailing on Allure of the Seas’next sailing and you feel you will not be able to arrive on Tuesday, please call us at 888-829-4050 in the U.S., and 408-926-9002 internationally. The Port of Miami closed at 11:00 p.m. yesterday evening and plans to reopen on Monday, August 27. Because of this, Majesty of the Seas’boarding on Monday will be delayed. Boarding will now start on Monday at 5:00 p.m. Guests can begin arriving at 5:00 p.m. and should arrive no later than 8:00 p.m.
Majesty of the Seas will call on Nassau, Bahamas, on Tuesday, August 27, as scheduled. However, the arrival time in Nassau may be impacted by the later departure. More information will be provided to guests once they board the ship. We encourage guests sailing Majesty of the Seas continue to monitor this website for any additional updates. Tropical Depression Eleven formed in the Eastern Atlantic and became Tropical Storm Kirk later in the evening. Based on the current projected path, it should stay out at sea but will strengthen into a hurricane in the next few days. We'll continue to monitor the storm to see if it impacts any cruises. MERGE WITH A FRONT BY MONDAY. On this the eve of the seventh anniversary of Hurricane Katrina, Louisiana and the Gulf Coast were once again bracing for the impact of a hurricane. Katrina was an extraordinarily powerful and deadly hurricane that first caused fatalities and damage in southern Florida as a Category 1 hurricane on the Saffir-Simpson Hurricane Scale. 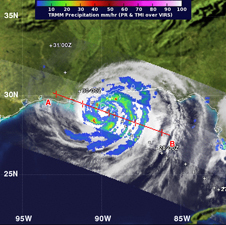 After reaching Category 5 intensity over the central Gulf of Mexico, Katrina weakened to Category 3 before making landfall on the northern Gulf coast. Even so, the damage and loss of life inflicted by this massive hurricane in Louisiana and Mississippi were staggering, with significant effects extending into the Florida panhandle, Georgia, and Alabama. Considering the scope of its impacts, Katrina was one of the most devastating natural disasters in United States history. New Orleans was severely impacted by Katrina, and has since rebuilt the levees that failed them back in 2005. The burning question for town residents tonight was - would they hold with this latest approaching storm. Fortunately, Hurricane Isaac was a much weaker storm, but don't let that fool you. It had the potential to bring heavy rains, flooding, power outages, damaging winds, and all the hazards associated with tropical cyclones. Isaac, which spans more than 200 miles, made landfall at about 6:45 p.m. local time near the mouth of the Mississippi River. New Orleans, about 75 miles to the northwest, was a ghost town as residents and tourists heeded warnings to stay indoors. Except for low-lying areas which were under mandatory evacuation orders, the majority of the folks stayed here to ride out the storm. Following is a comparison of the two storms. We trace some of the significant milestones as the two storms headed from the Atlantic to the Caribbean Sea and into the Gulf of Mexico before making landfall. For those that want even more information, see the storm and graphic archives on the NHC website. Another tropical storm has formed in the East Pacific. TD-9E formed well south of Mexico and has quickly developed into a named storm. It is currently no threat to land, but we will continue to monitor this storm. If you've been following our blog, you know that the Tampa Port Authority closed the port in anticipation of the approach of Tropical Storm Isaac. That isn't the only thing impacting cruise line schedules this week. Give yourself plenty of extra time to arrive at the port. The 2012 Republican National Convention is in town from Monday through Thursday. 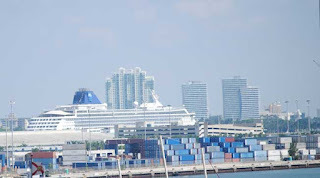 The 2012 Republican National Convention (RNC) will be held in Tampa the week of your sailing. Local authorities have advised us road closures and parking restrictions are expected. There will also be intermittent traffic delays and temporary closures on interstate roads and throughout the downtown area beginning Saturday, August, 25, through Thursday, August 30. A map indicating road closures is available at www.tampagov.net/rnc. Given traffic restrictions planned for this week, check-in for your cruise is now scheduled from 10:00 AM to 3:00 PM and we will sail shortly thereafter. It is essential you allow ample time to arrive at the terminal early enough to ensure you are not left behind. We’d like to apologize in advance for any congestion you may experience at the terminal as a result of the new check-in times. To expedite the boarding process, please ensure you have completed your online check-in prior to arriving. If you have already signed up for text during your online check-in, you will automatically receive updates. Many businesses in southern Florida sent staff home early over the weekend and have been functioning with limited staffing since that time. As the Port of Miami slowly resumes some operations today, things may start to get back to normal. According to reports, there was flooding and downed trees due to Tropical Storm Isaac but the winds were less than expected as it still stays as tropical storm strength. Tropical Storm Isaac Update Due to the tropical system affecting South Florida, we will be working with limited staffing Monday morning, and our hold times may be longer than normal. We expect to be fully staffed by noon EST, and thank you for your patience. Carnival Cruise Line is experimenting with network infrastructure changes on Carnival Magic which has yielded much improved upload and download speeds. It's not quite the same as being on your home network, but it is definitely an improvement of the slow connection speeds generally available at sea. The ship is the first in the fleet to undergo the changes. There currently is a six-week trial period in which the new changes are being tested in addition to some new pricing options. In the past, passengers paid per minute or they could purchase a package which bundled a number of pre-paid minutes at a lower per minutes cost. During the trial, you can sign up for $29.95 per day pricing or $119.95 for the 7-day cruise. One big advantage of this new pricing model is that you don't have to watch your minute usage and if you are using your own hardware, you can stay connected and simply power down your device(s) when not in use. 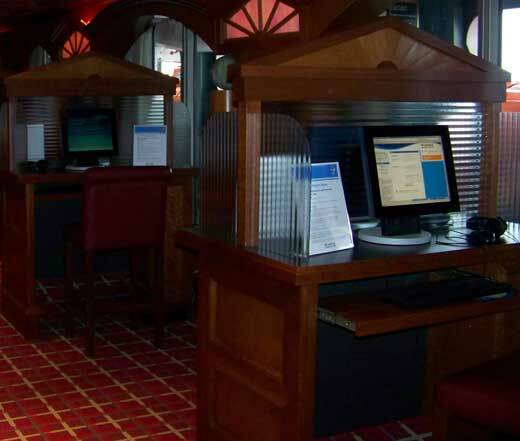 This eliminates the need to keep logging into Carnival's network each time you want to use the internet. Carnival will make decisions regarding the rest of the fleet after the conclusion of this trial period. We previously brought you news about changes the Royal Caribbean plans to introduce on Oasis of the Seas. In our article, High Speed Internet at Sea Coming Soon, we shared details about an upgraded communication network that will be coming to the largest ship afloat, Oasis of the Seas, next summer. Both cruise lines are responding to increased demand for connectivity at sea. With more and more light-weight portable devices emerging, it's not just the business traveler, that needs to stay in contact with the home office, that are seeking to be always connected even at sea. This is good news for those that want something close to "high-speed" access during their cruise vacation. Carnival Cruise Line is trying to get the next sailing of Carnival Elation, now a 3-day instead of a 4-day, to depart from Mobile, AL instead of New Orleans. The Port of Mobile has not reopened yet nor has the Port of New Orleans, so for not, it's a waiting game. If you are on that sailing, please sign up for text updates so that you'll have the correct embarkation information. UPDATED AUGUST 28TH: Due to its projected path, CARGO operations at the port of New Orleans closed yesterday (Aug. 27) at 5 p.m and will remain closed today (Aug. 28) and tomorrow (Aug. 29). There's no word yet from Carnival Cruises Lines on whether the Aug. 30 departure of Carnival Elation, the next scheduled ship to sail out of New Orleans, will be affected. Tampa, Miami, and Fort Lauderdale closed over the weekend, reopening yesterday. The closures caused some ships to remain at sea, sparking delays to their subsequent turn-around departures. Miami-Dade County is currently monitoring Tropical Storm Isaac. For more information, visit the emergency website, monitor your local news or call 3-1-1 in Miami, FL. PortMiami is open. Cruise passengers are encouraged to contact their respective cruise lines for the latest itinerary information. Cargo users should contact the cargo yard for status of operations. PortMiami is open for landside operations. Cargo users are encouraged to contact their respective cargo yard for their status of operations. Waterside operations remain closed. The U.S. Coast Guard is scheduled to reassess the waterways at 2 p.m. Cruise passengers should contact the cruise lines for the latest itinerary information. PortMiami is currently closed and will reopen on Monday, time to be determined. Cruise passengers are encouraged to contact their respective cruise line for more information regarding their itinerary. PortMiami is OPEN and is scheduled to close tonight at 11 p.m. U.S. Coast Guard Captain of the Port has established Hurricane Port Readiness Condition Modified YANKEE. 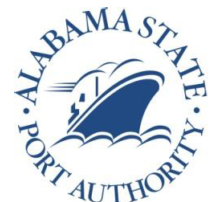 The Port is scheduled to open on Monday; time to be announced. Subscribe now to the County's program to receive text alerts to cell phones or other mobile devices about significant emergency events. The Tampa Port Authority, in conjunction with the Port Heavy Weather Advisory Group (PHWAG), is continuing to monitor T.S. Isaac, in determining the best and safest way to conduct port business, including all cargo and cruise operations. In consideration of the possible threat of T.S. Isaac on the safe navigability of Tampa Bay, the port authority has been alerted by the U.S. Coast Guard--Sector St. Petersburg Captain of the Port that they have issued 'Condition X-ray' today at 9:00 a.m., and therefore no vessels will be allowed to move into or out of the Port of Tampa after 3:00 a.m. Sunday. There will be no exceptions, including cruise vessels, unless there is a significant change in storm path or intensity. Tropical Storm Isaac continued to batter the Louisiana / Mississippi region today as it moved so slowly. It has finally become a Tropical Depression and picked up some speed, up to 12 MPH. Isaac is still impacting cruise schedules with Carnival Elation being the latest victim. It was originally scheduled to sail out of New Orleans on a 4-day itinerary August 30th. That was changed to a 3-day from Mobile, Alabama on August 31st. Even that is at risk because both ports remain closed. Carnival Cruise Line is monitoring the situation and advising passengers via text and posts on their website. We have the link for updates below. Cruise lines continue to monitor the progress of Isaac which is expected to become a hurricane this weekend. Several cruise itineraries have been impacted as well as ports have announced closures. We will attempt to keep this site updated as additional changes are made to cruise ship itineraries. For the absolute latest published information see the cruise line links directly. All changes are being made with the interest in safety of the ships, crew, and passengers. Please be certain that you cruise specialist, cruise line, and airlines have your contact information. Monitor the internet and other news media for updates. In the interest of readability, we have split the historical cruise ship impact from the current advisories. Click the following link for information about cruises that were impacted earlier. ALL COASTAL WARNINGS HAVE BEEN DISCONTINUED. SEE PRODUCTS ISSUED BY YOUR LOCAL WEATHER SERVICE OFFICE. STORM SURGE VALUE OF NEAR 4 FEET CONTINUES AT WAVELAND MISSISSIPPI. OF SOUTHEASTERN LOUISIANA AND MISSISSIPPI THROUGH THIS AFTERNOON. TONIGHT BEFORE SUBSIDING ON SATURDAY. TROPICAL STORM WATCH FOR JAMAICA. Tropical Storm Isaac made landfall along the southern coast of Haiti early Saturday morning, and has begun to move away from Haiti and towards southeastern Cuba, with its circulation relatively intact. Isaac is expected to make landfall in southeastern Cuba this afternoon, then skirt the northeastern coast of Cuba through the overnight hours tonight. Once off the northern coast of Cuba, Isaac is expected to strengthen into a hurricane over the warmer waters of the Florida Straits and cross the Florida Keys sometime Sunday night or early Monday morning, then head into the very warm waters of the eastern Gulf of Mexico. Hurricane warnings have been issued for portions of the northern Gulf Coast as Tropical Storm Isaac continues its west-northwestward march into the Gulf of Mexico. Isaac will continue to affect southern Florida with heavy rain, gusty winds and a tornado threat as it moves through the Florida Keys and into the Gulf Sunday evening. Isaac poses a potential serious threat to portions of the northern Gulf Coast Tuesday into Wednesday. All interests from Louisiana to Mississippi, Alabama and the Florida Panhandle should watch the progress of Isaac closely and begin to make preparations. Even areas as far west as extreme southeast Texas should continue to monitor Isaac's progress in case a farther west track materializes. Hurricane Isaac is impacting travelers and the transportation industry causing hundreds of flight cancellations and delays. Isaac's peak impacts are bearing down on the Gulf Coast beginning today. Hurricane warnings continue for portions of the northern Gulf Coast, including New Orleans, Biloxi and Gulf Shores as Isaac continues its northwestward march. Hurricane watches are posted as far west as Morgan City, La. In addition, a number of tropical storm warnings are in effect. A tropical storm warning is in effect for the Florida Panhandle. Even as Isaac's center of circulation moves by, locally heavy rainbands can be expected. Rainfall amounts over 10" are likely as Isaac slows down immediately prior to, and after landfall, in southeast Louisiana, southern Alabama, Mississippi and the western Florida Panhandle. In a few cases, amounts exceeding 20" are possible. We have already seen in excess of 9" of rain in some parts of the Florida east coast. Expect business closures and air, maritime, and ground transport disruptions throughout the region. Prolonged power and telecommunications outages are also possible. Hurricane Isaac made landfall in Southeast Louisiana at 6:45 PM local time on Tuesday. It made a second landfall overnight around 3 AM. This slow moving storm is dumping rain on the entire area, knocking out power to half a million people as 80 MPH winds continue to pound Louisiana. Damage is expected to be much higher than normal for this category hurricane, it is still a Category One, because of the slow movement. In addition to the storm surge, heavy rains, and flooding, there is a potential for tornadoes to be spawned from the storm.